The Los Angeles Philharmonic presents the West Coast premiere of Unsuk Chin’s daring Alice in Wonderland at Walt Disney Concert Hall, Friday and Saturday, February 27 and 28, at 8 pm. The Walt Disney Concert Hall is located at 111 South Grand Avenue, Los Angeles, CA 90012 (Get Directions Online). Click here for tickets. The ground-breaking, fully-staged opera, written by composer Unsuk Chin and Tony Award winning playwright David Henry Hwang, America’s most-produced living opera librettist who is best known for his critically acclaimed Puccini-inspired Broadway play M. Butterfly, offers a new remix of the Lewis Carroll story. Under the guidance of director/designer/video artist Netia Jones and with visual material derived from the illustrations of Fear and Loathing in Las Vegas gonzo-artist Ralph Steadman, Alice in Wonderland offers the audience a collision of styles and influences set on a black and white chessboard floor and featuring the orchestra as part of the set. Jones combines Steadman’s illustrations with live action, interactive animated projections that inhabit the scene alongside the performers, eye-popping costumes and choreography to bring to life Chin’s brilliant take on the Carroll fantasy. Conductor Susanna Mälkki leads the LA Phil in Alice in Wonderland. The cast includes soprano Rachele Gilmore as Alice and other performers listed below. The performance also features members of the Los Angeles Opera Chorus and the Los Angeles Children’s Chorus. Alice in Wonderland is part of the LA Phil’s new in/SIGHT series, which features concerts enhanced with video installations, and in some cases, additional artistic elements for a complete and immersive experience. The remaining in/SIGHT presentation in the 2014/15 season is: Beryl Korot and Steve Reich’s Three Talesperformed by Ensemble Signal, led by their music director Brad Lubman (May 29, 2015). As a much sought-after artist on the international conducting circuit, Susanna Mälkki has a versatility and broad repertoire have taken her to symphony and chamber orchestras, contemporary music ensembles and opera houses across the world. She has recently been appointed Chief Conductor of the Helsinki Philharmonic Orchestra, effective from the 2016/17 season. The 2014/15 season marks Mälkki’s second season as Principal Guest Conductor of the Gulbenkian Orchestra, which includes a gala opera evening with soprano Karita Mattila, Sibelius’ Tapiola and Mahler’s Symphony No. 9. Later in the season she conducts Shostakovich’s Cello Concerto No. 1 with Natalia Gutman and Bartók’s Concerto for Orchestra. Also in the 2014/15 season Mälkki debuts with the Philadelphia, Cleveland and New York Philharmonic orchestras, Chamber Orchestra of Europe and La Fenice. In addition, she returns to the San Francisco Symphony, Helsinki Philharmonic and Royal Stockholm Philharmonic orchestras. Described by The Observer newspaper as “the most imaginative director of opera working in Britain today” Netia Jones is a director, designer and film-maker in opera, theatre and classical music. A “leading pioneer in integrating film and video into live music performances” (Times), she is the Director of Lightmap, a mixed media creative studio working in the UK, Europe and the U.S. Recent projects include Curlew River with Ian Bostridge for Lincoln Center, CalPerformances, Carolina Performing Arts, and the Barbican London, Feldman’sWords and Music for Happy Days at International Beckett Festival in Ireland, and Kurtág’s Kafka Fragments for The Royal Opera House. Future projects include a new production of Atthis by Georg Frederich Haas for the Royal Opera House, Covent Garden, London, Les Illuminations with Daniel Harding for the Swedish Radio Symphony Orchestra and a new staged production of Hans Zender’s orchestral interpretation of Schubert’s Winterreise with Ian Bostridge at the Barbican Theatre. Unsuk Chin was born in 1961 in Seoul, South Korea, and has lived in Berlin since 1988. Her music has attracted international conductors including Simon Rattle, Gustavo Dudamel, Kent Nagano, Esa-Pekka Salonen, David Robertson, Peter Eötvös, Neeme Järvi, Markus Stenz, Myung-Whun Chung, George Benjamin, Susanna Mälkki, François -Xavier Roth, Leif Segerstam and Ilan Volkov, among others. It is modern in language, but lyrical and non-doctrinaire in communicative power. Chin has received many honours, including the 2004 Grawemeyer Award for Music Composition for her Violin Concerto, the 2005 Arnold Schoenberg Prize, the 2010 Prince Pierre Foundation Music Award, and the 2012 Ho-Am Prize. In 2007, Chin’s first opera Alice in Wonderland was given its world première at the Bavarian State Opera as the opening of the Munich Opera Festival and released on DVD by Unitel Classica. Her second opera Alice Through the Looking Glass is commissioned by The Royal Opera in London for premiere in the 2018/19 season. Since 2006, Chin has overseen the contemporary music series of the Seoul Philharmonic Orchestra, a series which she founded herself. Since 2011, she has served as Artistic Director of the ‘Music of Today’ series of the Philharmonia Orchestra in London. Portrait CDs of her music have appeared on Deutsche Grammophon, Kairos and Analekta. David Henry Hwang‘s work includes the plays M.Butterfly, Chinglish, Yellow Face, Golden Child, The Dance and the Railroad, and FOB, as well as the Broadway musicals Aida (co-author), Flower Drum Song (2002 revival), and Tarzan. Upcoming productions include two new musicals: The Forgotten Arm, with music and lyrics by Aimee Mann and Paul Bryan, for the Public Theater; and Pretty Dead Girl, with music and lyrics by Anne-Marie Milazzo. As America’s most-produced living opera librettist, he has written four pieces with composer Philip Glass, including The Voyage (Metropolitan Opera, 1992), as well as Osvaldo Golijov’s Ainadamar (two 2007 Grammy Awards), Bright Sheng’s The Silver River (1997), Unsuk Chin’s Alice in Wonderland (2007 “World Premiere of the Year” by Opernwelt magazine), Howard Shore’s The Fly (2008) and Huang Ruo’s An American Soldier (2014). Upcoming operas include Through the Looking Glass with Unsuk Chin for the Royal Opera House Covent Garden and Dream of the Red Chamber with Bright Sheng for the San Francisco Opera. Mr. Hwang penned the screenplays for M. Butterfly (1993), starring Jeremy Irons and John Lone; Golden Gate (1994), starring Matt Dillon and Joan Chen; and Possession (co-writer, 2002), starring Gwyneth Paltrow and Aaron Eckhart. With the pop star Prince, he co-wrote the song “Solo,” released on Prince’s 1994 gold album Come. He is currently writing a feature film for Dreamworks Animation and the film adaptation of Chinglish, to be directed by Justin Lin (Better Luck Tomorrow, the Fast & Furious franchise), as well as creating an original television series, “Shanghai,” for Lions Gate and Bravo. 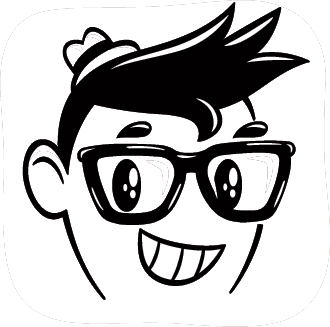 Hwang is a Tony Award® winner and three-time nominee, a three-time Obie Award winner, and a two-time Finalist for the Pulitzer Prize. He received the 2011 PEN/Laura Pels Award, the 2012 William Inge Award, the 2012 Steinberg “Mimi” Award, and the 2014 Doris Duke Artist Award, and recently completed his the Residency One Playwright term at NYC’s Signature Theatre, which produced a season of his plays, including the world premiere of his newest work Kung Fu in February 2014. He serves as President of Young Playwrights Inc, and sits on the boards of the Lark Play Development Center, The American Theatre Wing, and The Actors Fund. But an opera? He couldn’t refuse. 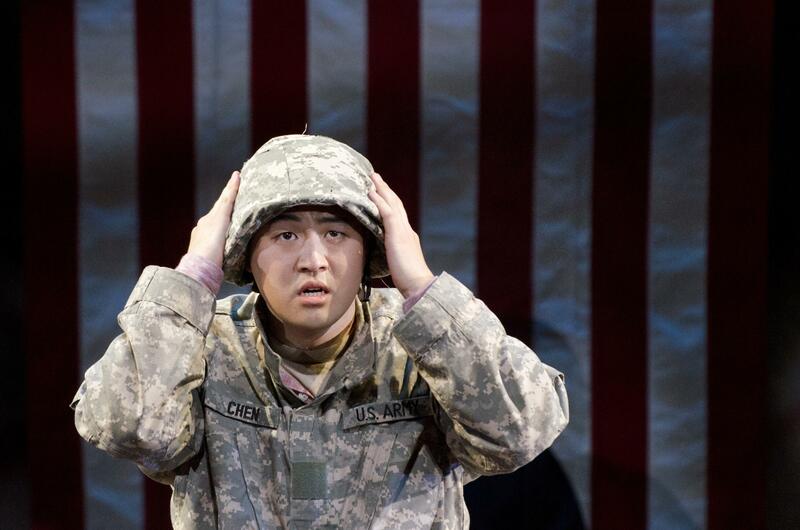 “This is a story with big emotions, big primary colors in a way, and big plot events,” says Hwang, who wrote the libretto for An American Soldier, a new hourlong opera commissioned by Washington National Opera. Set to premiere on Friday at the Kennedy Center in Washington, D.C., the production is based on news accounts of Chen’s life and the investigation into his death. The American-born son of Chinese immigrants, Chen was raised in New York City’s Chinatown and enrolled in the Army after high school. The opera focuses on a fictional court-martial of one of Chen’s superiors. In real life, eight soldiers, including one officer, were charged in connection with his death. All were either demoted or dismissed from the Army, and most received brief prison sentences. To better understand the story, Hwang says he consulted with members of the military. “Most of them feel that it’s understandable that this could happen, particularly in a battlefield in Afghanistan, where all of a sudden there’s no checks and balances,” he says. 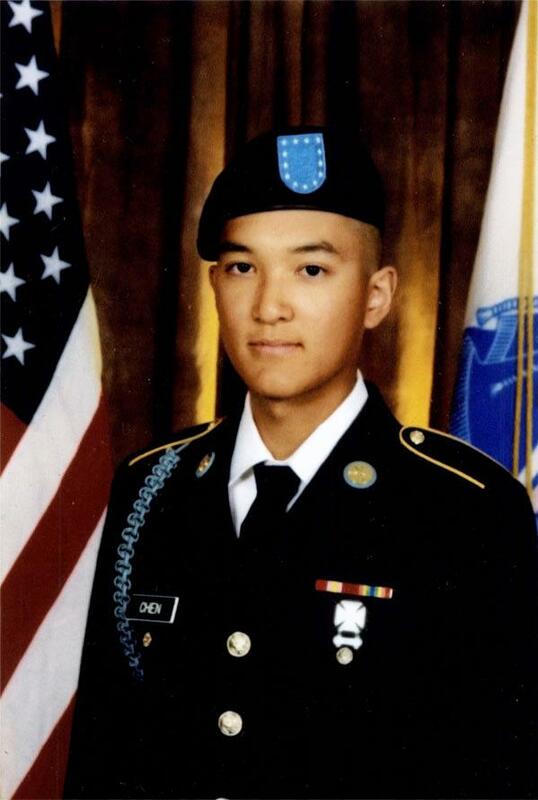 Chen’s death helped drive legislation signed by President Obama last year that required new reviews of the military’s response to hazing. 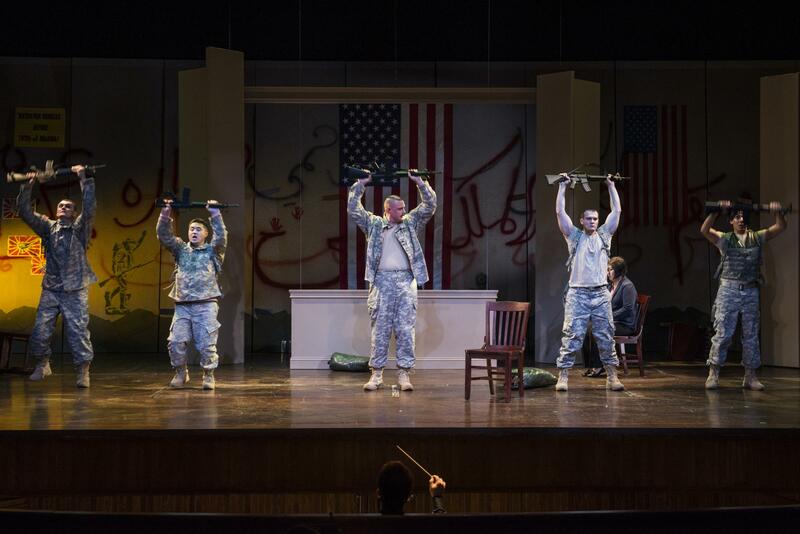 But for tenor Andrew Stenson, who plays Chen in the opera, this story isn’t just about bullying in the military. Almost three years since Chen’s death, his parents continue to grapple with the loss of their only child, who enlisted against his mother’s wishes. At a recent street co-naming ceremony honoring Chen in New York City’s Chinatown, his mother, Su Zhen Chen, offered a tearful thanks to supporters. Composer Huang Ruo, who wrote the music for An American Soldier, admits his latest project focuses on a “very sad” story. “But as a society, we need to come together to learn from it,” he adds. “When it’s sung in the mezzo-soprano voice, it’s magical,” Huang says. 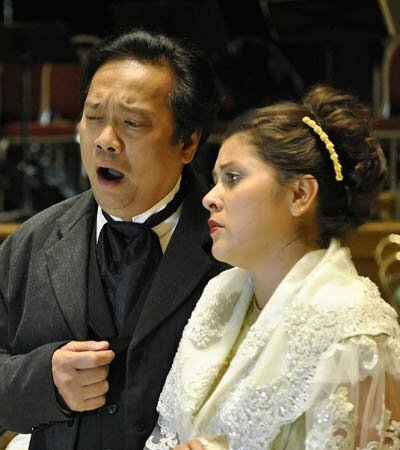 That mezzo-soprano voice comes from Guang Yang, who plays Chen’s mother in the opera. Yang says the opera is a tribute to Su Zhen Chen’s commitment to keeping her son’s story alive. Philippine history will be made in the fall with the premiere of “Noli Me Tángere” (Touch Me Not), the first Filipino opera to run in New York. This landmark opera is based on the great novel of the same name, by the Philippine national hero Dr. Jose Rizal. Music by Felipe Padilla De Leon, libretto by Guillermo Tolentino, and will be staged in full orchestral splendor with Filipino opera artists for the first time in the East Coast.